Having those questions answered in detail will give you a better understanding of what you should be looking for in your ideal candidate. But beyond that, there are certain characteristics and qualities that set excellent customer service employees apart. While customer service skills can be improved though training and mentoring, it takes tremendous effort and motivation to change natural behavior. That’s why identifying the following traits in potential candidates might be even more important than a certain skill set. Self-awareness – recognizing and understanding your own moods and motivations and their effect on others. Self-regulation – the ability to control disruptive impulses, to suspend judgment and to think before acting. Internal motivation – a passion to work for internal reasons that go beyond money and status -which are external rewards. Empathy – the ability to understand another person’s emotional reaction. Social skills – identifying social cues to establish common ground, manage relationships and build networks. Customers’ emotions aren’t one-size-fits all. Being able to recognize and understand other people’s feelings, moods and reactions is a crucial element in building successful, meaningful relationships. If this element is missing, it will make it hard for a customer service rep to make a connection with a customer. People with higher emotional intelligence are also better at understanding their own psychological state and are able to manage stress effectively. Hiring tip: One of the key questions to ask on an interview to reveal a candidate’s real level of emotional intelligence is ‘Tell me about a time you received negative feedback from your boss. How did that make you feel?’ Emotionally intelligent people are self-confident, open-minded and are well-equipped to handle and positively utilize critical feedback without letting it damage their self-worth. While people with low emotional intelligence typically get offended or defensive when presented with tough feedback. It should not be hard to identify the two based on the answers. On top of that, positive attitude helps to beat job-related stress. In this digital age when almost any information can be easily found online, very few people would contact customer support to inquire about products or services. In most cases support agents have to deal with angry customers and their frustration. In fact, this is an inescapable part of their day-to-day operations, and it would be nearly impossible to remain calm, professional and effective without being able to maintain a positive attitude. Hiring tip: When interviewing candidates for customer service positions, make sure to look for those who demonstrate a positive outlook and enthusiasm for the role and the company they would soon be part of. There might be dozens of interview questions to ask in order to test a positive attitude. One of them is asking candidates to explain their motivations in choosing to join and leave companies they’ve worked for, including their current employer. Hiring tip: When interviewing potential candidates, look for those who demonstrate they have taken on new responsibilities in their past roles, or have shown themselves to be flexible in any other ways. Apart from that, seek those who show a true desire to constantly learn something new and improve their skills. Asking a question ‘What skill or expertise do you feel like you’re still missing?’ will help to identify those who truly want to get better at what they do and the ones who think they already know it all. 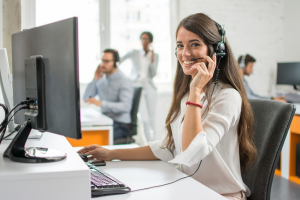 Passion for helping others may not be everything required to provide outstanding customer service, but it certainly is one of the key things to look for in a potential candidate. When you go into a pet store, you naturally expect the people working there to love animals. Just in the same way, frontline agents dealing with customers should be passionate about customer service and helping people. Without passion, the experience is emotionless, for both employees and customers. Hiring tip: Don’t look for someone who is just searching for a temporary job, look for someone who wants to build a career in customer service. Ask questions like ‘What first drew you to work in customer service?’ and ‘Why should we choose you over someone else?’ Besides, a passion for service goes hand-in-hand with a personable attitude and friendliness. A candidate who smiles, looks you in the eye and acts pleasantly during an interview will likely be welcoming and helpful to customers. These qualities and personality traits that would make the best customer-focused employees are hardly ever listed on resumes – they are rather to be spotted when talking face-to-face with potential hires. Which of them do you consider the most important and what else would you add to the listed above? As always, comments and feedback are a much appreciated! This entry was posted in Articles, Best Practice and tagged customer service hiring tips, customer service skills, customer service traits, ideal customer service rep, perfect customer service representative. Bookmark the permalink. Can you suggest how to tackle changing the stale mindset of an existing small support team who are not particulary open to changing their approach to customer service? Knowledge of the product is there, but every other listed skill is considerably lacking. I’ve found the article extremely helpful to me as a starting point to change their mindset, but I’m concerned at how a shake up will be received! I totally agree that a person who smiles and looks you in the eye will assure you that they are welcoming and helpful to other people. I guess that is the right personality that a sales assistant must have. My sister can use this tip to hire a good one since they will need their services to finally sell their house which has been in the market for about a year now.